Noir! What Is It Good For? 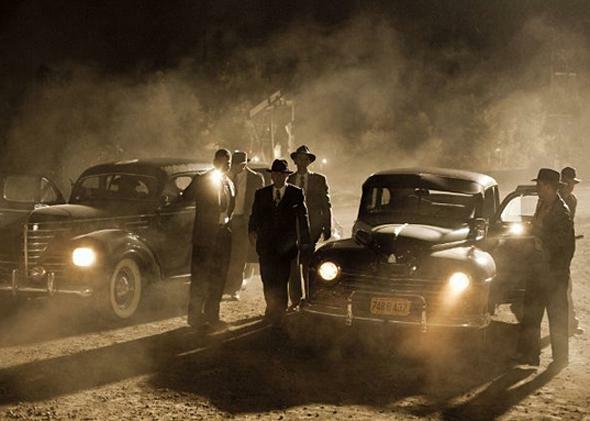 Well, it makes TNT’s Mob City pretty watchable, for starters. The hyper-stylized Mob City is a welcome respite from overserious gangster shows. Between the ultra-violence, the gangsters, and the cliché about gray—just recently used on Low Winter Sun, a damning association—it would have been almost impossible for Mob City, which premieres Wednesday night, to have made a worse first impression on me. We all have our tastes and our biases: Give me a British drawing room drama and I barely care if I’ve seen that upstairs-downstairs romance before. Give me another self-serious, bloody, gangster piece and I wish for a pair of cement boots. But, to bust out a cliché of my own, first impressions can be deceiving: Mob City is not just a rehash of mobster tropes, it’s an almost exuberant rifling of noir staples. (The show is based on a book called L.A. Noir; it covers exactly the same period as the recent film Gangster Squad.) There are shout-outs to James Cagney and The Untouchables, but it’s with respect to noir that Mob City really becomes a quote machine. The first episode kicks off the series’ plot when Teague is asked to help a comedian (Simon Pegg) blackmail the Mob with salacious photo negatives—the bait in the infamously convoluted The Big Sleep. A mark in an Italian restaurant has a nose bandaged up just like Jake Gittes. The femme fatale (Alexa Davalos) speaks with the sort of placeless, slightly British, trans-Atlantic accent of the studio era. There are notes written inside of matchbooks and secrets hiding in train depot lockers and neon hotel signs flashing through windows. And then there’s Teague himself, who has Bernthal doing a spiritual impression of Bogey at his most long-suffering. How has it been nearly 50 years since Philip Marlowe or Sam Spade had a TV show? Mob City has all the hallmarks of exhausted anti-hero television (mostly, in Teague, it has the exhausted anti-hero), but it’s surprising how much fresher those gambits feel when wedded to noir. Noir, like its no-nonsense detectives, is innately opposed to exactly the sort of pretension and self-seriousness that has made recent gangster dramas like Low Winter Sun and Ray Donovan so insufferable. For starters, noir can be notoriously lax about plot. Raymond Chandler famously couldn’t keep The Big Sleep’s story straight, and that—at least in a pre-nitpicking-Internet age—hardly mattered. I’m not suggesting that Mob City’s plot won’t add up, but in its first two episodes it is pretty damn elliptical. It’s the mood, not the plot, that really counts. This hyper-stylization—the heady rhythm of the fast-flying dialogue, the pre-ordained double cross, the cynicism—keeps the overwrought and overearnest in check. At the end of Teague’s opening speech about black hats and white hats, he deadpans, “In real life it’s different. In real life the bad guys often wear flashy shoes,” a note of jocularity the Sam Spades of the world—but not your everyday anti-hero—are ontologically mandated to inject into the proceedings. I don’t want to give the impression that Mob City is a great noir. It’s just adequate, but adequate noir can really enliven an otherwise tedious gangster story. Bernthal’s Bogey impersonation tamps down all of his charisma. The historical characters are all Jewish mobsters, but for now the show is uninterested in how their outsider status might have helped determine their profession. Bugsy Siegel (Ed Burns) and Mickey Cohen (Jeremy Luke) have never been so dull. But noir has been so unexploited by current television that a noir pastiche is less tiresome than a gangster one. Better a reboot of Philip Marlowe than yet another retread of Tony Soprano.